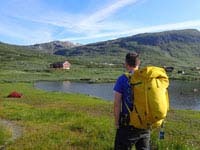 Bob from the Nature Travels Team puts the Thule Versant 70 litre men’s fit pack through its paces on a multi-day trip to the Jotunheimen mountains of Norway. Last year we reviewed the Thule Capstone 32L and Thule Capstone 50L packs, and liked them very much, so when the nice people at Thule asked us to take a look at the larger Versant 70L, we were delighted. 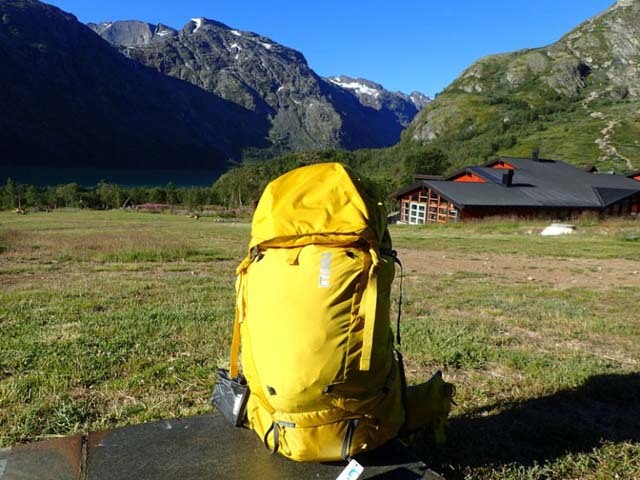 And it just so happened that I had a hiking trip in Norway coming up, which would provide an excellent opportunity to test the pack over an extended period. Getting ready for the day at Memurubu. Photo: Nature Travels. 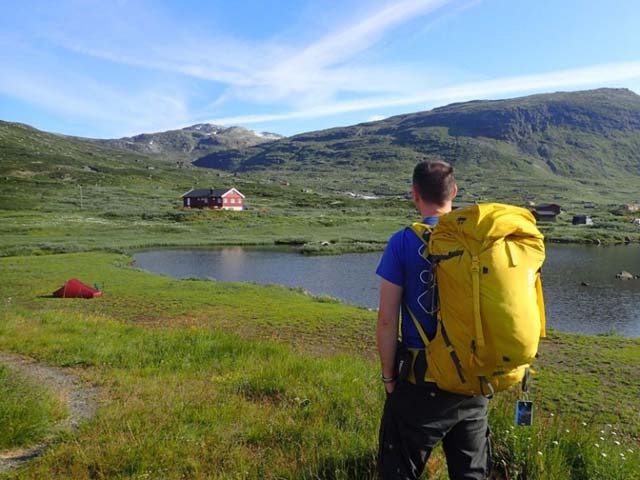 We would be trying out a new tour itinerary starting from the Gjendesheim cabins, going over the Besseggen ridge (one of Norway’s most popular day hikes) to Memurubu, up and over again to Gjendebu, through the Svartdalen valley to Torfinnsbu, and finally down the lake to Fondsbu. 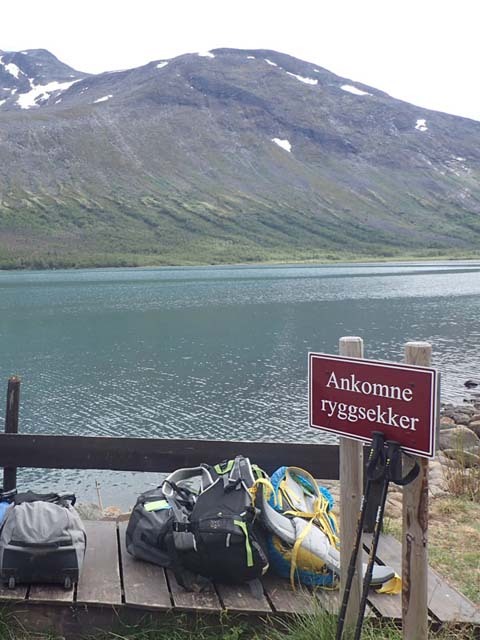 For the hikes themselves, we’d only need daypacks (I took the Capstone 32L) as the tour would be making clever use of the public boat connections to ferry our main luggage between the overnight stops. Nevertheless, with all the lugging about en route at the start and end of the trip, plus that the boat jetties where you drop and collect your bags tend to be some distance from the cabins, there would be plenty of opportunity to be walking with the Versant for extended periods as well. The Versant is big enough to take everything you need for a longish trip, and the top compartment is extendable if you need to squeeze in just one more thing. Photo: Nature Travels. Now I don’t normally consider myself old, being a mere spring-chicken-like 48, but sometimes you can’t help feeling that the world has moved on. When I first hoisted a backpack in my younger days, it was just that – a bag that you strapped to your back – and little more. Hardly anything was adjustable and if the frame wasn’t quite the right length or the straps dug in a bit, you just put up with it. Fast forward a few years and the humble backpack has evolved. Now there are compartments for this, pouches for that and optional attachments for the other of every conceivable kid. In the case of the Versant, virtually every bit of it is adjustable and personalisable, from the back length to the amount of hip belt (really useful that, actually, when it came to adjusting the pack for comfort) to the height at which the chest strap sits. If you can’t fit everything you want into the Versant, you’re probably taking too much! Photo: Nature Travels. So I admit to feeling a little puzzled with some features initially, as there’s a lot going on with this pack. But considering the Versant has a very good chance of outlasting its owner, spending 10 minutes getting to know it from the outset will be time well spent. After a few minutes of stubbornly scratching my head trying to figure out by myself how some bits worked, I finally swallowed my pride and watched the video, which is of course what I should have done from the start. How simple everything becomes when you know how it’s done! Once you’ve got everything adjusted, the Versant is very comfortable indeed. The weight sits nicely at your hips and the whole thing feels solid and dependable. All the zips (I’m a stickler for good zips) feel like very good quality and the whole pack has quite a luxurious, premium feel to it, which of course you’d expect given the fairly high-end price. No matter how organised I am with my packing, invariably whatever I want at any particular moment is right at the bottom, so I really like that the Versant has a zippable front panel to easily find items in the main body of the pack. This makes it a good travel pack for general backpacking holidays, as you can simply unzip the front panel when you get to your accommodation to access what you need for the night without unpacking the whole bag. I also really liked the “stuff-it” elasticated pocket at the front, which is a feature of all the Thule packs I’ve tried. Obviously great for quick access to a spare raincoat or trousers when hiking (which you can then put back when the rain’s over without getting the rest of your packing wet and muddy), on this trip I found it made the perfect dirty-laundry pocket to stash smelly socks and t-shirts! 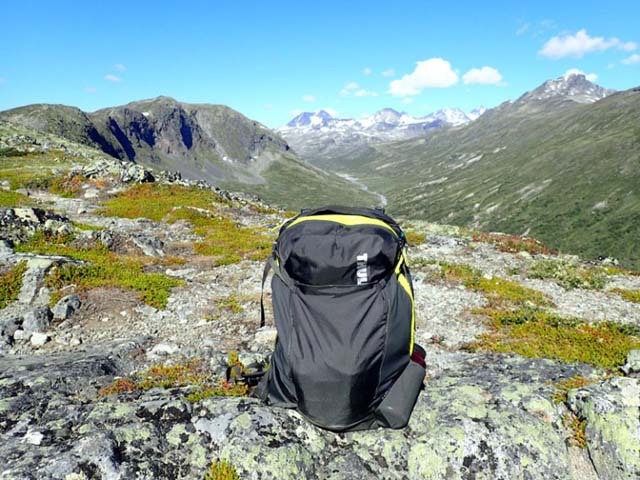 The Capstone 32L I was using as a daypack gets a rest looking over Memurudalen. Photo: Nature Travels. Thule describe the integral rain cover as a “StormGuard system of partial rain cover with a waterproof bottom liner that allows easier access, keeps gear drier, and is more durable than a traditional rain cover”. This may sound like sales blurb, but actually I really loved the cover – it emerges from its own pouch near the bottom of the pack and attaches securely to loops on the side to hold it in place. It covers about 75% or so of the height of the pack leaving the waterproof bottom to protect the rest. This makes the cover much less likely to be ripped and scuffed when the pack is on the ground. I used it daily for covering the pack during the boat transports and it worked really well. Plus you can still have easy access to the side pockets to get to your water bottle even with the cover on. And in homage to its Swedish pedigree, the rain cover is a nice blue to complement the pack’s yellow! The Versant with its protective rain cover waiting for collection. Photo: Nature Travels. The Versant with its protective rain cover waiting for collection. The hip-belt has Thule’s “VersaClick” system to attach optional accessories such as a camera bag or water bottle holder. As standard, the pack came with a roll-top waterproof pouch. I confess I couldn’t really find anything I wanted to put in this – the video shows it being used for a mobile phone, which would be ideal, but mine was a bit too tight a fit. Perhaps it would be good for a smaller phone, GPS, or maybe a few peanuts! The VersaClick system on the hip belt comes with a waterproof pouch as standard. Photo: Nature Travels. Another feature of the Versant is its detachable top, which, as Thule describes it, “converts to a sling pack for summit hikes”. Here, I must say, it took me a while to figure this out. My spatial awareness is not always what it should be, in fact I’m quite capable of being a bit dense sometimes (as a child, though older than I care to admit, I once sat outside my house for half an hour convinced that my Mum had given me the wrong key, only to discover later that I’d been holding it upside down). So when I first tried to make sense of the sling pack, I got myself in some terrible tangles. But after more head scratching, some minor strangulation and a couple of looks at the video, I finally got it! Once you’ve worked out how to put it one, the daypack works very well! Photo: Nature Travels. Once you’ve worked out how to put it one, the daypack works very well! 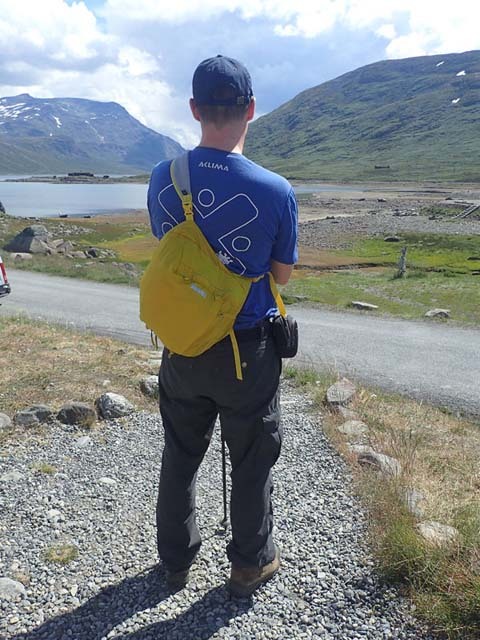 The trip gave me the opportunity to try the sling pack for exactly what Thule intends, a summit hike. The last part of the trail between Gjendebu and Fondsbu has not yet been finished, so instead we took the boat for this section, leaving us time at Fondsbu for a glorious walk up to the summit of Utsikten (meaning literally “the viewpoint”, but also the name of the mountain), a fairly easy 3-hour trip rewarding us with a stunning panorama from the top. 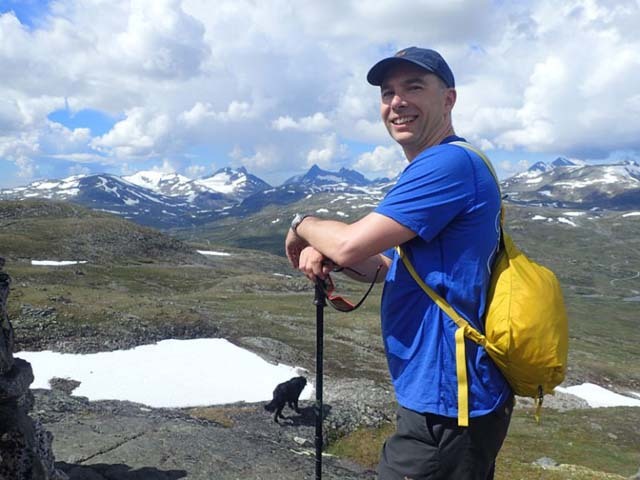 Admiring the view from the summit of Utsikten. Photo: Nature Travels. Given the design, I was a bit sceptical about how comfortable this little pack would be – I took a one-litre bottle of water, a rain jacket and a thin extra layer, which pretty much filled it up – but one you’ve got the straps untwisted and adjusted properly, the bag sits snugly and was very comfortable. I probably wouldn’t want to use it for a longer walk, and of course it’s not going to take the place of a proper daypack, but for a shortish walk or a day exploring town when you’re travelling, it’s just fine. The Versant’s top converts to a useful little day pack for short trips. Photo: Nature Travels. And lastly, a word about the colour. 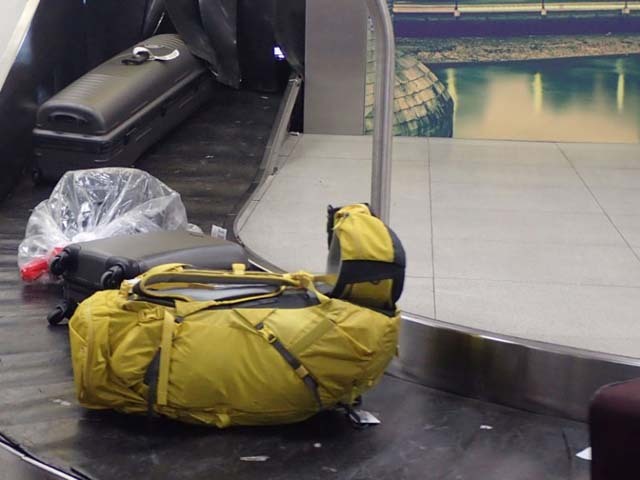 Mine was a glorious sunny yellow, a welcome change from the boring greys and blues of your typical pack – this not only adds a little bit of sunshine to any trip, but also means there’s unlikely to be any confusion on the luggage belt! You’ll have no trouble recognising your pack on the luggage belt! Photo: Nature Travels. You’ll have no trouble recognising your pack on the luggage belt! It probably isn’t going to stay quite so bright and shiny for long – the finish has already picked up a few spots and stains – but a bit of dirt adds character to any piece of outdoor gear. The mountains of Jotunheimen from the top of Utsikten. Photo: Nature Travels. At an RRP of £200 (though available for less), the Versant is a pricey-ish pack. 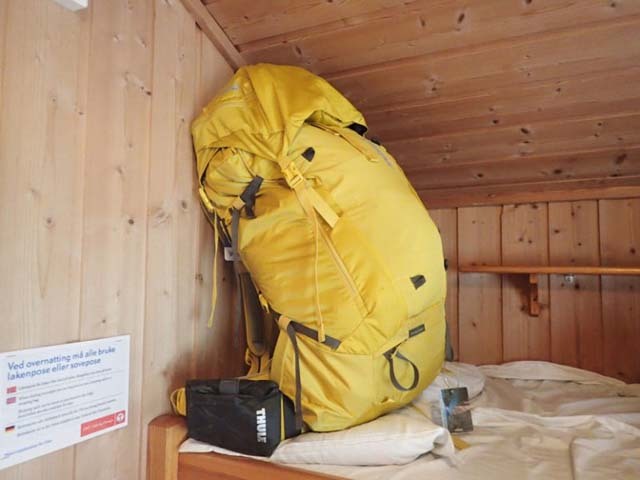 But, as we’ve said before, when it comes to outdoor equipment, it’s well worth investing in quality, not only to save yourself the frustration and difficulty of your gear failing in the middle of a trip, but also as a sound environmental choice and, in the long-run, a sound financial one. 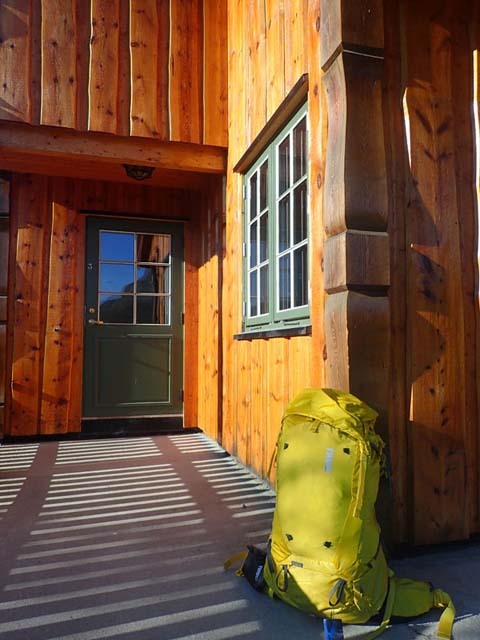 Unless you’re a dedicated follower of outdoor fashion always wanting the newest gear, I doubt you’ll need to buy a new pack for a very long time. 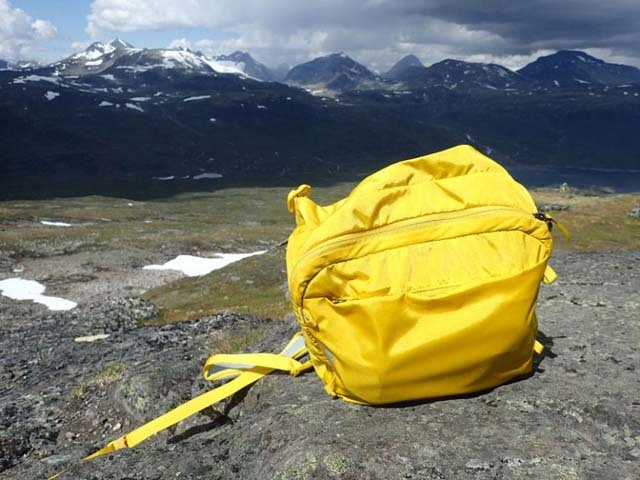 If you’re often to be found out and about, whether for extended hiking trips or just general travelling, and feel you’re likely to make good use of a pack of this quality, the Versant should be a trustworthy companion and well worth the investment. 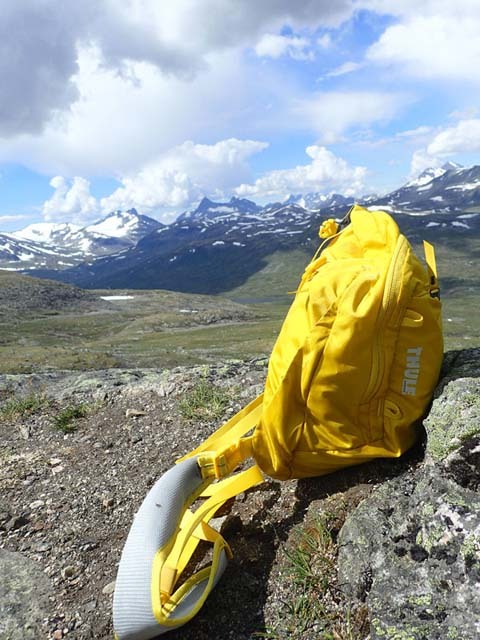 And if you find the 70L model more than you need, the pack also comes in 50L and 60L versions. Plus, it’s yellow, and it’s from Sweden. What’s not to like?